FIND IT QUICKLY! — FIND WHAT YOU NEED BY "KEYWORD:" Use your browser's page search (FIND) ability (Ctl or Cmd "F") to search for the "keyword" you wish to locate: Use Ctl or Cmd "G" to "find next." Featuring in-depth stories on County projects and initiatives that were completed within the past quarter, projects that are currently underway and projects that are planned in the months ahead. To subscribe and receive future editions of Brevard Delivers, please visit http://apps.brevardcounty.us/PublicInformationReleases/ and be sure to click on Brevard Delivers under Public Information Release Categories. Click to view this TV program - 51 minutes. A new space race is underway on the Space Coast and Brevard County could end up as the big winner. TITUSVILLE, FL. — The North Brevard Commission on Parks and Recreation will hold its next monthly meeting at 5 p.m. Thursday, April 11. The meeting will be held in the Brevard Room at 518 South Palm Avenue in Titusville. The public is invited to attend. The Brevard Room is located in a building on the North side of the parking lot behind the Brevard County Government Center. For questions please call Jeff Davis Jr. at (321) 264-5105. In accordance with the Americans and Disabilities Act and Section 286.26, Florida Statutes, persons needing accommodations or an interpreter to participate in the proceeding should notice Parks and Recreation North Area no later than 48 hours prior to the meeting by contacting Jeff Davis Jr. at (321) 264-5105. Brevard County, FL. - A meeting of the Environmentally Endangered Lands Program's Qualifying Committee, established by the Brevard County Board of County Commissioners will be held from 3 - 4 p.m. on Tuesday, March 19, in the Parks and Recreation Department Administrative Conference Room, 2724 Judge Fran Jamieson Way, Building B, Room 203, Viera, Florida. The purpose of this meeting is to review applications for volunteer positions on the Environmentally Endangered Lands Program's Selection and Management Committee. Any questions regarding this meeting should be directed to Laura Clark (321) 255-4466 or Laura.Clark@brevardfl.gov. If a person desires to appeal any decision made by this board, agency or commission (as appropriate) with respect to any matter considered at this meeting or hearing, such a person will need a record of this proceeding and that, for such purposes, such person may need to ensure that a verbatim record of this proceeding is made, at his/her own expense, wich record includes testimony and evidence upon which any such appeal is to be based. In accordance with the Americans with Disabilities Act and Section 286.26, F.S., persons needing accommodations or any interpreter to participate in the proceeding should contact Laura Clark, EEL Program Administrative Secretary, no later than 48 hours prior to the meeting at 321-255-4466. BREVARD COUNTY, Fla. -- Brevard County Ocean Rescue is hosting flexible tryouts for seasonal lifeguards through Feb. 9. Those wishing to try out need to schedule a time by emailing FR_oradmin@brevardcounty.us. No lifeguarding experience is necessary, but candidates must be over the age of 16 and possess strong swimming skills. All candidates must bring a valid driver's license, Social Security card, appropriate swim attire, a towel and running shoes. If selected, completion of the hiring process is dependent on the candidate's ability to pass a background test and successful completion of Ocean Rescue's paid training academy. The starting pay for ocean lifeguards is $10.39/hour. For additional information on the tryouts and Brevard County Ocean Rescue, please visit the department's page at www.brevardfl.gov/FireRescue/OceanServices. You can also contact Ocean Rescue staff at (321) 633-2056 or email at fr_oradmin@brevardcounty.us. Rockledge, Fla -- Brevard County Fire Rescue (BCFR) is pleased to announce the donation of 174 Pet Masks. The donated masks will be used by our BCFR crews to treat our furry family members suffering from smoke inhalation during a fire event. The generous donation from Invisible Fence and our partners from local veterinary hospitals and their doctors will be made at 10 a.m. on Monday, March 4, at BCFR Administration offices, 1040 S. Florida Ave, Rockledge, Florida, 32955. Each year, it's estimated more than 40,000 pets die in fires, mainly due to smoke inhalation. The reality is, in most cases first responders lack the equipment to resuscitate and save these animals. This donation will allow for all BCFR units to be equipped with a Pet Mask kit, each containing three sizes, and ultimately aid and enhance BCFR's response to all victims on the scene of fire incidents. BREVARD COUNTY, FL. -- A meeting of the Environmentally Endangered Lands Progam's Selection and Management Committee, and Procedures Committee established by the Brevard County Board of County Commissioners, will be held from 2:45 - 4:30 p.m. on Wednesday, March 6, at the EEL Program Office, 91 East Drive in Melbourne. The public is welcome to attend. The purpose of this meeting is to provide an annual joint meeting of both groups for a review of the Program's operations. Any questions regarding this meeting should be directed to Laura Clark (321) 255-4466 or Laura.Clark@brevardfl.gov. If a person desires to appeal any decision made by this board, agency or commission (as appropriate) with respect to any matter considered at this meeting or hearing, such a person will need a record of this proceeding and that, for such purposes, such person may need to ensure that a verbatim record of this proceeding is made, at his/her own expense, which record includes testimony and evidence upon which any such appeal is to be based. In accordance with the Americans with Disabilities Act and Section 286.26,F.S., persons needing accommodations or any interpreter to participate in the proceeding should contact Laura Clark, EEL Program Administrative Secretary, no later than 48 hours prior to the meeting, at 255-4466. BREVARD COUNTY, FL. -- A meeting of the Environmentally Endangered Lands Program's Selection and Management Committee, established by the Brevard County Board of County Commissioners, will be held from 1 - 2:30 p.m. on Wednesday, March 6, at the EEL Program Office, 91 East Drive in Melbourne. The public is welcome to attend. The Selection and Management Committee serves as an expert scientific advisory committee to the County Commissioners on all issues involving the EEL Program nature sanctuary network in Brevard County. In accordance with the Americans with Disabilities Act and Section 286.26, F.S., persons needing accommodations or any interpreter to participate in the proceeding should contact Laura Clark, EEL Program Administrative Secretary, no later than 48 hours prior to the meeting at (321) 255-4466. BREVARD COUNTY, FL. -- The Brevard County Environmentally Endangered Lands (EEL) Program is seeking volunteers to serve on the Selection and Management Advisory Committee. The committee serves as an expert scientific advisory committee to the County Commission on all issues involving the management of environmentally endangered lands acquired under the EEL Program. The Environmentally Endangered Lands Program was initially created by Brevard County voters in a 1990 referendum. The Program was established to provide a funding mechanism for the long-term management of a nature sanctuary network in Brevard County. Four year post secondary academic degree (B.S. or equivalent) or a minimum of 6 years of demonstrated professional expertise in biological or environmental sciences. Demonstrated knowledge of Brevard County Ecosystems and conservation land management techniques. Interested individuals may obtain a Committee Membership Application on the EEL website at the following link https://www.brevardfl.gov/EELProgram and submit the application along with their resume to the EEL Program Office at 91 East Drive, Melbourne, FL 32904. Attention Mike Knight, 321-255-4466. Or via email at mike.knight@brevardfl.gov. The deadline forsubmissions is Tuesday, March 5. BREVARD COUNTY, FL. -- The Brevard Marine Advisory Council (BMAC) will host an information presentation by the St. John's River Water Management District (SJRWMD) and the Melbourne Tillman Water Control District (MTWCD) on recent nutrient reduction measures associated with Turkey Creek and the Indian River Lagoon. The presentation will be during the regularly scheduled BMAC meeting at 6 p.m. Thursday, Feb. 21, in the Space Coast Conference Room at the Viera Government Center, Building C, Second Floor, 2725 Judge Fran Jamieson Way, Viera, 32940. Bill Tredik, initiative leader with SJRWMD, will give an update on completion of Phase I of the C1 Canal Rediversion and how it is helping reduce the nutrients discharged into Turkey Creek and the lagoon. Tredik will also talk about SJRWMD's plans for Phase II of the C1 Diversion Program. Mike McCabe, district engineer at the MTWCD, will provide an update on new equipment and procedures for controlling aquatic weeds in the major C1 Canal and its contributing canals. McCabe will have videos of a new mechanical harvester in action. These presentations will show the progress being made to reduce the nutrient load and accumulations of muck that are potentially associated with the C1 Canal and nutrient loading to the lagoon and Turkey Creek. BREVARD COUNTY, FL. - The Environmentally Endangered Lands Program's Selection and Management Committee, established by the Brevard County Board of County Commissioners, will be visiting Scottsmoor Flatwoods Sanctuary West from 9 a.m. - noon on Sunday, Feb. 3. The public is welcome to attend. Participants will be meeting at the Rail Trail parking area at the intersection of Aurantia Road and Blounts Ridge Road in Mims. From Aurantia Road, pass under the I-95 overpass and turn right on Blounts Ridge Road. The trail parking is immediately on the left. The purpose of this site visit is to receive a tour of publicly-held conservation lands to assess ecological management accomplishments. Please RSVP no later than noon on Friday, Feb. 1. For further questions regarding this meeting or to RSVP please contact Laura Clark (321) 255-4466 or email Laura.Clark@brevardfl.gov. In accordance with the Americans with Disabilities Act and Section 286.26, F.S., persons needing accommodations or any interpreter to participate in the proceeding should contact Laura Clark, EEL Program Administrative Secretary, no later than 48 hours prior to the meeting, at (321) 255-4466. BREVARD COUNTY, FL. - A meeting of the Environmentally Endangered Lands Program's Selection and Management Committee, established by the Brevard County Board of County Commissioners, will be held from 1 - 4 p.m. on Wednesday, Feb. 6, at the EEL Program Office, 91 East Drive in Melbourne. The public is welcome to attend. Those trying out should meet at Rockledge High School's swimming pool, 220 Raider Rd, no later than 7 a.m. Candidates will not be permitted to test if they are late. While no lifeguarding experience is necessary, candidates must be over the age of 16, and possess strong swimming skills. All candidates must bring a valid driver's license, Social Security card, appropriate swim attire, a towel and running shoes. Candidates will be required to swim 500 meters in less than 10 minutes, complete a 1-mile run on a track in less than 10 minutes and perform a physical agility test that includes push-ups. Advanced registration is not required; however applicants are reminded that testing will begin promptly and anyone arriving after testing begins will not be permitted to try out. Titusville, FL. - The North Brevard Commission on Parks and Recreation will hold its next monthly meeting at 5 p.m. on Thursday, Feb. 14. The meeting will be held in the Brevard Room at 518 South Palm Avenue in Titusville. The public is invited to attend. The Brevard Room is located in the building on the north side of the parking lot behind the Brevard County Government Center North. For questions, call Jeff Davis at (321) 264-5105. If a person desires to appeal any decision made by this commission with respect to any matter considered at this meeting or hearing, such person will need a record of this proceeding and that, for such purposes, such person may need to ensure that a verbatim record of this proceeding is made, at his or her own expense, which record includes testimony and evidence upon which any such appeal us to be based . Section 286.105, Florida Statutes. In accordance with the American Disabilities Act and Section 286.26, Florida Statutes, persons needing accommodations or an interpreter in the proceeding should notice Parks and Recreation North Area no later than 48 hours prior to the meeting by contacting Jeff Davis Jr. at (321)264-5105. Merritt Island, FL. -- The 8th Annual Pioneer Day Festival will take place from 10 a.m. to 4 p.m. on Saturday, Feb. 9, at Sams House at Pine Island Conservation Area and St. Luke's Episcopal Church located at 5555 & 6195 North Tropical Trail on Merritt Island. This festival will celebrate the early settlers of Merritt Island at two of their historic sites. Guests will be taken back in history through art, music, food, presentations, archaeology, and nature. This family friendly day includes activities from past festivals as well as new attractions. Parking is available at both locations for a suggested donation of $1 with free shuttle service between the two venues. Florida living history demonstrations and educational exhibits include archaeology and anthropology, historic reenactors, encampments with artifacts on display, and spinning wool demonstrations. The Sams House at Pine Island is a historical complex owned and operated by the Brevard County Environmentally Endangered Lands Program. The 1875 Sams Cabin onsite is the oldest standing home in Brevard County. A larger 1888 two-story home is also onsite. John Sams, a citrus-grower and the first Superintendent of Brevard County Schools, built both houses. The Center is located at 6195 N. Tropical Trail, 1/2 mile west of SR 3 and 5 miles north of SR 528. For information please call, (321) 449-4720 or visit https://www.facebook.com/samshousepineisland. St. Luke's Cemetery Tour - "An Archaeologist's Perspective" - by Molly Thomas at 10:15 a.m.
"St. Luke's Chapel: A Gem of Carpenter Gothic Architecture" (presented in the historic chapel) at 11 a.m.
St. Luke's Cemetery Tour - "Founding Families" at 11:30 a.m. Cemetery Stroll - meet many of the historic figures found in this early Merritt Island cemetery at 12:30 - 2 p.m.
"Rebuilt and Remade: Florida citrus in the early 20th century" at 2 p.m.
St. Luke's Cemetery Tour - "Through the Ages" at 2:30 p.m. This year St. Luke's is offering an array of topics. Visitors can learn about the architecture of St. Luke's historic chapel built in 1889. This chapel is an outstanding example of Carpenter Gothic architecture, a uniquely American architecture. During the presentation of "Rebuilt and Remade: Florida citrus in the early 20th century", the audience will learn more about the heyday of the citrus groves in Florida, from its mechanization to the rise and fall of the cooperatives and the influence of African Americans in Florida citrus. Also available are guided cemetery tours, each with a unique theme. In addition to the tours St. Luke's will also conduct a Cemetery Stroll from 12:30 - 2 p.m., where volunteers dressed in period attire talk about life in their day. Some of the volunteers are Sams' family descendants. The historic chapel onsite was built in 1888 with the help of Sams, LaRoche, and Porcher families. Many early pioneers, including John Sams, are buried in the church's cemetery. The church is located at 5555 N. Tropical Trail, just 1.1 miles south of Sams House at Pine Island. For information please call (321) 452-5260 or visit http://www.stlukesmi.org. For more information regarding this event please visit: www.mipioneerday.com and www.facebook.com/pioneerdaymerrittisland. Brevard County, FL. - A meeting of the Environmentally Endangered Lands Program's Procedures Committee, established by the Brevard County Board of County Commissioners will be held at 3 p.m. on Thursday, Jan. 17, at the EEL Program Office, 91 East Drive in Melbourne. The public is welcome to attend. The purpose of this meeting is to review policies and procedures of the Brevard County Environmentally Endangered Lands Program. If a person desires to appeal any decision made by this board, agency or commission (as appropriate) with respect to any matter considered at this meeting or hearing, such a person will need a record of this proceeding and that, for such purposes, such person may need to ensure that a verbatim record of this proceeding is made, at his/her own expense which record includes testimony and evidence upon which any such appeal is to be based. In accordance with the Americans with Disabilities Act and Section 286.26, F.S., persons needing accommodations or any interpreter to participate in the proceeding should contact Laura Clark, EEL Program Administrative Secretary, no later than 48 hours prior to the meeting at (321)255-4466. BREVARD COUNTY, Fla. -- Brevard County Ocean Rescue will host tryouts for seasonal lifeguards on Jan. 5. Ocean Rescue is looking to fill 50 positions. Those hired on as ocean lifeguards will work from March to October for the 2019 year. Those trying out should meet at Rockledge High School's swimming pool, 220 Raider Rd, no later than 7 a.m. Candidates will not be permitted to test if they are late. While no lifeguarding experience is necessary, candidates must be over the age of 16 by Jan. 15, and possess strong swimming skills. All candidates must bring a valid driver's license, Social Security card, appropriate swim attire, a towel and running shoes. BREVARD COUNTY, FL. – Commissioner Curt Smith, who represents District 4 on the Brevard County Board of County Commissioners, has been appointed to the Central Florida Expressway Authority to represent Brevard citizens' interest on future transportation needs in the region. Smith received the appointment from County Commission Chairman Kristine Isnardi. His first CFX meeting is scheduled for 9 a.m. Thursday, Dec. 13, in Orlando. The CFX, established in 2014, is a toll-funded organization responsible for transportation planning in a region that includes Brevard, Lake, Orange, Osceola and Seminole counties. "I am deeply honored and extremely excited to be representing Brevard County on the Central Florida Expressway Authority," Smith said. In November, Smith was re-elected to his second four-year term on the five-member Board of County Commissioners. District 4 includes all or part of Indian Harbour Beach, Melbourne, Palm Shores, Rockledge and Satellite Beach, as well as sections of unincorporated Brevard, including Suntree and Viera. One of the major accomplishments in Smith's first term in office included getting Brevard County represented on the CFX. While serving as chairman of the Brevard Board of County Commissioners, Smith presented his case in 2017 for Brevard's inclusion to the Authority. The CFX heard his proposal and voted unanimously to accept Brevard as its newest member. Smith's appointment to the CFX is for a one-year term. BREVARD COUNTY, FL. -- Once again it's time to "Speak Up Brevard." In an effort to provide a formal process for citizens to submit recommendations to Brevard County Government, and as a result of charter amendment, Brevard County is implementing a web-based application called "Speak Up Brevard." The online form will be available through Jan. 1, 2019, at www.brevardfl.gov. It allows citizens to submit ideas which would assist county government in conserving energy, saving costs, eliminating duplication, generating revenue, increasing productivity, or preventing waste. A hard-copy version of the form may also be submitted, and is available through the County Manager's office. The process requires submissions to meet a deadline of Jan. 1, after which the County Manager's office has 45 days to evaluate and comment on the recommendation, and then forward it to the Board of County Commissioners for review. The Board of County Commissioner must take a final vote to either approve, reject, or revise and accept the recommendation within 120 days. The sponsor of the recommendation will be given at least a week's notice prior to it being heard and voted on by the Board. A listing of all recommendations, including disposition, will be posted on the County website. Visit www.brevardfl.gov, click on the Government tab and then, in the category labeled "Provide Feedback," recommendations can be posted under the heading "Speak Up Brevard." Brevard, Fla. -- Brevard County Ocean Rescue has announced that the county's seasonal lifeguard towers closed Sunday, October 28. The County's 5 year-round towers will remain in operation until the Spring. BREVARD COUNTY, FL. -- Volunteers who are helping Keep Brevard Beautiful rid county beaches of dead fish that was ashore as a result toxic red tide algae are being heralded for their cleanup efforts, but the best intentions of others have created a new concern that came to light on Friday. Some beachgoers are collecting fish and then leaving them in plastic bags in areas that are nowhere near the dumpsters used by Keep Brevard Beautiful (KBB) in its daily cleanup mission. That means those bags of dead fish sit on the beach in the hot sun or eventually wash out into the ocean with the tide. Random bags of fish have begun showing up along the beach. Keep Brevard Beautiful and Brevard County Natural Resources are asking anyone who wants to voluntarily participate in the cleanup effort to work with KBB and its volunteers. "Peoples' hearts are in it, and we greatly appreciate it," said Bryan Bobbitt, deputy executive director for KBB. "We've got a lot of sites and we're hoping those who want to help will work with us." KBB, which has contracted with the County for beach cleanup, is seeking volunteers for cleanups scheduled Saturday, Oct. 27, at 10 a.m. starting in Bon Steel Park, 8455 A1A, Melbourne Beach, then moving to Spessard Holland South Beach Park, 2525 Highway A1A, Melbourne Beach. KBB provides all of the supplies, including face masks, gloves, shovels and bags, but asks cleanup volunteers to be prepared by wearing appropriate clothing for a cleanup that involves dead fish. To Contact Keep Brevard Beautiful, please call (321) 631-0501. Red tide is commonly used to describe a higher-than-normal concentration of microscopic algae. Brevard County Government's Natural Resources Management Department, in coordination with FWC, continues to collect water samples to detect algae elevation levels of red tide along Brevard County beaches. All beach areas remain open, but beachgoers are advised to heed warnings posted at beach areas, especially if they feel their health may be at risk. The Florida Department of Health has posted answers to frequently asked questions about red tide and its health risks at this link: http://www.floridahealth.gov/environmental-health/aquatic-toxins/red-tide.html. Information can also be found at this FWC link: http://www.myfwc.com/research/redtide/contact/. To report a fish kill, call the FWC Fish Kill Hotline: 1-800-636-0511. VISIT FLORIDA provides visitors up-to-date beach condition reports here: http://myfwc.com/research/redtide/statewide/ and visitbeaches.org. Also, for a VISIT FLORIDA red tide FAQ, including seafood safety information, visit https://www.visitflorida.org/resources/crisis-preparation/red-tide-information. BREVARD COUNTY, FL. -- Volunteers are sought at three South Beach locations where Keep Brevard Beautiful will be working Thursday (Oct. 25) morning to rid the beaches of dead fish that have washed ashore as a result of red tide algae. South Beaches have experienced some of the worst fish kills related to the toxic algae that has littered beaches all over the state with dead fish, and posed health-related conditions for beachgoers that range from irritated throats, eyes and noses to more serious conditions for people with chronic respiratory problems. Red tide first began showing up in water tests off the county's shoreline last week. Thursday morning, Keep Brevard Beautiful, which has contracted with the County for beach cleanup related to red tide, will be at three locations and is asking for assistance from willing volunteers. Keep Brevard Beautiful provides all of the supplies, including face masks, gloves, shovels and bags, but asks cleanup volunteers to be prepared by wearing appropriate clothing for a cleanup that involves dead fish. BREVARD COUNTY, FL. -- The Environmentally Endangered Lands Program's Selection and Management Committee, established by the Brevard County Board of County Commissioners, will be visiting Fox Lake Sanctuary on Saturday, Nov. 10, from 9 a.m.- noon. The public is welcome to attend. Participants will be meeting at 4400 Fox Lake Road in Titusville. The purpose of this site visit is to receive a tour of publicly held conservation lands to assess ecological management accomplishments. Please RSVP no later than noon on Friday, Nov. 9. For further questions regarding this meeting or to RSVP please contact Laura Clark at (321) 255-4466 or email Laura.Clark@brevardfl.gov. If a person desires to appeal any decision made by this board, agency or commission (as appropriate) with respect to any matter considered at this meeting or hearing, such a person will need a record of this proceeding and that, for such purposes, such person may need to ensure that a verbatim record of this proceeding is made, at his/her own expense, which record includes testimony and evidence upon which an such appeal is to be based. In accordance with the Americans with Disabilities Act and Section 286.26, F.S. persons needing accommodations or any interpreter to participate in the proceeding should contact Laura Clark, EEL Program Administrative Secretary, no later than 48 hours prior to the meeting, at (321) 255-4466. BREVARD COUNTY, FL. - Celebrate autumn at the Enchanted Forest Sanctuary during our 3rd annual Harvest Festival, 10 a.m. to 3 p.m., Saturday, Nov. 3. During this free event, guests are invited to enjoy guided hikes, hay rides, special presentations, meet bats, reptiles and other Florida wildlife, explore environmental exhibitors, listen to live music, and much more. Harvest Festival will feature many children's activities, including face painting, hands-on activities exploring forest animals and autumn, nature crafts, and more. Live music will be provided by The Freightliners Bluegrass band. Local vendors include The Organic Elephant: Organic Produce, Kona Ice, Jersey Girl Super Foods, and Chicken Waffle Grill. The Enchanted Forest Sanctuary is located at 444 Columbia Blvd., Titusville, FL. 32780. TITUSVILLE, FL. -- The North Brevard Commission on Parks and Recreation will hold its next monthly meeting at 5 p.m. Thursday, Nov. 8. The meeting will be held in the Brevard Room at 518 South Palm Avenue in Titusville. The public is invited to attend. BREVARD COUNTY, FL. -- A meeting of the Environmentally Endangered Lands Program's Recreation and Education Advisory Committee, established by the Brevard County Board of County Commissioners, will be held from 6-8 p.m. on Thursday, Nov 8, at the EEL Program Office, 91 East Drive, in Melbourne. The public is welcome to attend. The purpose of this meeting is to review proposed recommendations for public access, passive recreation and environmental education plans on EEL Program managed conservation lands. IIf a person desires to appeal any decision made by this board, agency or commission (as appropriate) with respect to any matter considered at this meeting or hearing, such a person will need a record of this proceeding and that, for such purposes, such person may need to ensure that a verbatim record of this proceeding is made, at his/her own expense, which record includes testimony and evidence upon which any such appeal is to be based. BREVARD COUNTY, FL. -- Beachgoers in southern areas of Brevard County are advised to take precautions following confirmation Wednesday of red tide conditions that have tested at a high level in Satellite Beach and been detected at medium to lower levels along other beaches in the southern part of the county, according to tests results released by the Florida Fish and Wildlife Commission (FWC). The Florida Department of Health on Wednesday issued advisories to warn beachgoers of potential health impacts of red tide. More information can be found at this link: http://brevard.floridahealth.gov/newsroom/2018/10/red-tide-2018-10-17.html. Red tide is commonly used to describe a higher-than-normal concentration of microscopic algae in the water that can kill fish and can also cause a variety of health-related conditions, ranging from eye, nose and throat irritation to more serious issues for people with chronic respiratory conditions. The current red tide began on the state's west coast and gradually worked its way south. More recently, the red tide has moved up the east coast of the state and into Brevard County. Earlier this week, sporadic sightings of dead fish were reported along with some air quality complaints from beachgoers. Brevard County Government's Natural Resources Management Department, in coordination with FWC, collected water samples to detect for the presence of red tide on Tuesday, Oct. 16, along Brevard County beaches. Testing locations included Juan Ponce de Leon Park in south Melbourne Beach, Nance Park in Indialantic, Pelican Park in Satellite Beach and Murkshe Park in Cocoa Beach. Test results on Wednesday indicated medium levels of red tide off the shoreline in Indialantic (600,450 Karenia brevis cells per liter) and Melbourne Beach (312.000 at Spessard Holland South and 126,000 at Juan Ponce de Leon) and at a high level (1.35 million) in Pelican Beach Park in Satellite Beach. Some test results are still pending in other areas along the beach in Brevard County. Brevard County Government's Natural Resources Department, along with the Tourist Development Council (TDC), Florida Department of Health, FWC and the Fish and Wildlife Research Institute have been monitoring conditions and working on a response plan, depending on the severity of red tide conditions. Beaches will remain open, though signage warning of red tide conditions will be posted. Beachgoers who sense respiratory issues should leave the beach. The TDC is working with hoteliers and attractions and other council members to redirect visitors to other beach areas or the numerous other attractions in the area that can be enjoyed without exposure to the impacts of red tide. Information can also be found at this FWC link: http://www.myfwc.com/research/redtide/contact/. BREVARD COUNTY, FL. -- Water tests conducted Tuesday with Florida Fish and Wildlife Commission (FWC) and Wildlife Research Institute on a strip of Melbourne Beach at Ponce de Leon Park will be used to determine whether algae related to red tide has made it into the waters off Brevard County's southern coastline. It's anticipated test sample results will be available Wednesday. Brevard County has been monitoring the spread of red tide which has progressed from the Gulf Coast of Florida to the east coast and gradually, up the coastline to Indian River County. "Brevard is fortunate that red tides don't make it up the east coast to Brevard County very often and don't usually last for long here. The state only adds testing on the east coast when symptoms arise," said Virginia Barker, Director of Brevard County Natural Resources Management Department. Natural Resources staff, however, is also pulling water samples from beaches further north as a proactive measure. This week, reports from beachgoers between Sebastian Inlet and Indialantic have begun to indicate they believe red tide may have reached southern Brevard County. Coordination efforts were already underway in Brevard County, which has reached out to other agencies in the event problems associated with red tide, such as fish kills or health-related issues that could affect beachgoers, were realized here. Some sporadic reports regarding respiratory issues and minimal sightings of dead fish have been reported on south beaches since Monday. Agencies already working with the County include the Florida Department of Health, FWC Fish and Wildlife Research Institute, Keep Brevard Beautiful and the Tourist Development Council. According to the Florida Department of Health, breaking waves can cause red tide-related toxins to become mixed with airborne sea spray, creating problems for beachgoers, including eye, nose and throat irritation. Symptoms will likely subside once a person leaves the beach area, but people with chronic respiratory conditions like asthma or lung disease are advised to avoid areas with active red tides. Brevard County Fire Rescue Ocean Rescue, which has lifeguards stationed along the beach, has reported receiving some complaints from beachgoers, but beaches remain open. The Department of Health has posted answers to frequently asked questions about red tide and its health risks at this link: http://www.floridahealth.gov/environmental-health/aquatic-toxins/red-tide.html. BREVARD COUNTY, FL. -- Brevard County Emergency Management Director Kimberly Prosser and Emergency Management Planning Coordinator Kate Dean were deployed to the Florida Panhandle on Thursday as part of a six-member Emergency Operations Center support team in the aftermath of Hurricane Michael. Prosser and Dean are working with directors from Polk County and Flagler County emergency management offices and their staffs as the recovery begins from the Category 4 hurricane that made landfall on Wednesday. The effort is part of a statewide mutual aid agreement. "This was a devastating hurricane and the recovery could take years," Prosser said. "It's important in times of need that we do what we can to help our fellow citizens get their lives back to normal as soon as possible and hopefully, if the need ever arises, they would do the same for us." Other opportunities for assistance may be available in the days and months ahead. Brevard County Government has a paid emergency/disaster leave policy that allows employees that meet certain criteria to volunteer to provide specific kinds of emergency services in state and national disasters. "I'm proud that we have employees who are willing and able to quickly respond and render aid and manpower as part of this recovery effort," County Manager Frank Abbate said. Prosser and Dean are prepared for a 14-day deployment assisting emergency management response and recovery operations in Calhoun County. BREVARD COUNTY, FL. -- A meeting to review a Proposed Public Access Plan for the Environmentally Endangered Lands Program's Pine Island Conservation Area will be held on from 6:30 - 7:30 p.m. on Thursday, Oct. 18 at the Sams' House Management and Education Center located at 6195 North Tropical Trail on Merritt Island. The purpose of this meeting is to gather public input from stakeholders and users on a proposed public access plan for the Pine Island Conservation Area. Any questions regarding this meeting should be directed to David DeMeyer at 321-449-4720 or David DeMeyer@brevardfl.gov. In accordance with the Americans with Disabilities Act and Section 286.26, F.S., persons needing accommodations or any interpreter to participate in the proceeding should contact Laura Clark, EEL Program Administrative Secretary, no later than 48 hours prior to the meeting, at (321)255-4466. BREVARD COUNTY, FL - A meeting of the Environmentally Endangered Lands Program's Procedures Committee, established by the Brevard County Board of County Commissioners, will be held from 2-4 p.m., on Thursday, Nov. 1, at the EEL Program Office, 91 East Drive, in Melbourne. The purpose of this meeting is to review policies and procedures of the Brevard County Environmentally Endangered Lands Program. In accordance with the Americans with Disabilities Act and Section 286.26, F.S., persons needing accommodations or any interpreter to participate in the proceeding should contact Laura Clark,EEL Program Administrative Secretary, no later than 48 hours prior to the meeting at (321) 255-4466. TITUSVILLE, FL. -- The North Brevard Commission on Parks and Recreation will hold its next monthly meeting at 5 p.m. Thursday, Oct. 11. The meeting will be held in the Brevard Room at 518 South Palm Avenue in Titusville. The public is invited to attend. If a person desires to appeal any decision made by this commission with respect to any matter considered at this meeting or hearing, such a person will need a record of this proceeding and that, for such purposes, such person may need to ensure that a verbatim record of this proceeding is made, at his/her own expense, which record includes testimony and evidence upon which any such appeal is to be based. Section 286.0105, Florida Statutes. 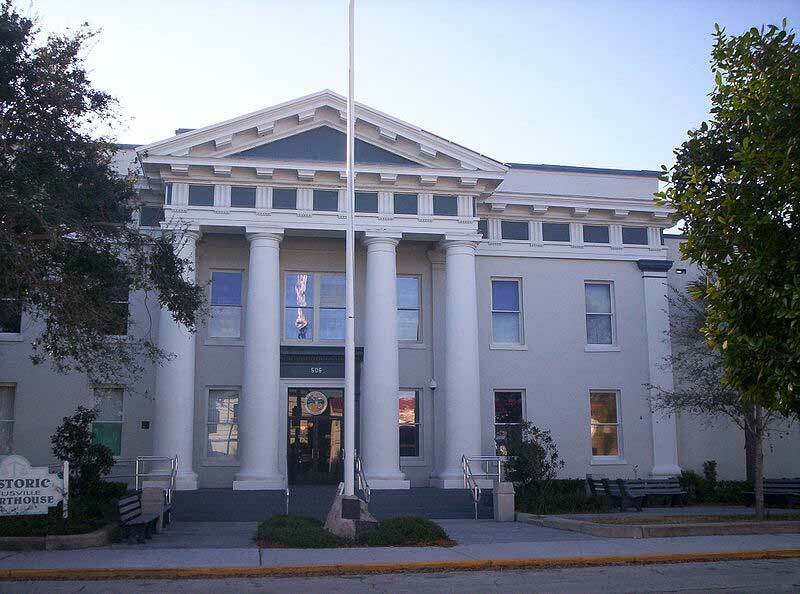 In accordance with the Americans and Disabilities Act and Section 286.26, Florida Statutes, persons needing accommodations or an interpreter to participate in the proceeding should notice Parks and Recreation North Area no later than 48 hours prior to the meeting by contacting Jeff Davis Jr. at (321) 264-5105. BREVARD COUNTY, FL. - A meeting of the Environmentally Endangered Lands Program's Selection and Management Committee, established by the Brevard County Board of County Commissioners, will be held from 1 p.m. - 4 p.m. on Friday, Oct. 5, at the EEL Program Office, 91 East Drive, in Melbourne. If a person desires to appeal any decision made by this board, agency or commission (as appropriate) with respect to any matter considered at this meeting or hearing, such a person will need a record of this proceeding and that, for such purposes, such person may need to ensure that a verbatim record of this proceeding is made, at his/her own expense, which record includes testimony and evidence upon which any such appeal is to be based. In accordance with the Americans with Disabilities Act and Section 286.26, F.S., persons needing accommodations or any interpreter to participate in the proceeding should contact Laura Clark, EEL Program Administrative Secretary, no later than 48 hours prior to the meeting at (321) 255-4466. TITUSVILLE, FL. -- The North Brevard Commission on Parks and Recreation will hold its next monthly meeting at 5 p.m. Thursday, Sept. 13. The meeting will be held in the Brevard Room at 518 South Palm Avenue in Titusville. The public is invited to attend. BREVARD COUNTY, FL. – 2-1-1 Brevard and the Titusville Police Department will offer crisis counseling assistance to families and witnesses to a shooting incident that occurred Saturday at Isaac Campbell Park in Titusville. The shooting occurred just after 5 p.m. Saturday during a back-to-school rally held at the park. One person was injured. An estimated 150 people, mostly school-aged children, were at the park when the incident occurred. On Tuesday, Brevard County Parks and Recreation worked with 2-1-1 Brevard and Titusville Police to provide crisis counseling referrals for anyone at the park on Saturday who is in need of assistance. Trained specialists are available 24/7 by dialing 2-1-1, or contact Victim Advocate Michelle Flowers with Titusville Police Department at 321-567-3941. BREVARD COUNTY, FL. - Results of water quality samples from four County groundwater wells on the Barrier Island measure well within Environmental Protect Agency safety standards for drinking water, according to lab results received Friday by Brevard County's Natural Resources Management Office. "These chemicals are in many household products including Teflon cooking pans, some food wrappers, stain-resistant clothing, carpet and more, so it's not surprising to find some in the groundwater. The question is whether the levels are dangerous or unusually high. To have more information, the County compared groundwater in residential areas of Satellite Beach to conservation land in the south beaches," said Virginia Barker, director of Brevard County's Natural Resources Management Department. Some states set guidelines for the compounds at lower levels than the EPA recommendation. Minnesota, for example, set drinking and groundwater levels at 35 parts per trillion for PFOA and 27 parts per trillion for PFOS. Added together, this sum of 62 is lower than EPA's total of 70 parts per trillion. The County well results are lower than the individual Minnesota standards for PFOS and PFOA as well as being lower than the EPA total standard. 26.7 parts per trillion was the highest concentration recorded, and two samples were pulled from this well to make sure the lab analysis was consistent. The second sample for this well located at a residential site on the north of DeSoto Parkway in Satellite Beach was very similar, at 25.8 parts per trillion. 18.7 parts per trillion, was recorded from a residential site located on the south side of DeSoto Parkway. 6.3 parts per trillion was the cleanest site, sampled from a second residential site on the north side of DeSoto Parkway. 6.6 parts per trillion was recorded from a control well in the Coconut Point Preserve area located several lots south of Publix in the south beaches. The county paid just over $3,000 for the tests. Samples were pulled in mid-July from wells that were installed in June for the purpose of measuring reductions in groundwater pollution that occur as a result of projects funded by the Save Our Indian River Lagoon sales tax. Applied Ecology Inc. is the environmental consulting firm that sampled the wells. Pace Analytical Lab in Minnesota, considered a national center of expertise for measuring these chemicals, performed the lab analysis. The compounds tested were among 28 chemicals that the EPA required water systems to test for between 2013 and 2015. Neither Melbourne nor Cocoa's drinking water systems found any of the chemicals during that testing requirement, EPA data show. Brevard County's results will be presented at a community meeting from 2-4 p.m. Sunday, Aug. 5, at the Satellite Beach Civic Center. Groundwater is used for irrigation and sprinkler systems. Brevard County was among local government agencies that conducted recent well testing on the Barrier Island in response to residents' concerns over health-related issues, the potential source, contamination levels and exposure risks. BREVARD COUNTY, FL. -- Brevard Delivers, Brevard County Government's second quarterly report for 2018, is now available online at http://www.brevardfl.gov/BrevardDelivers. Brevard Delivers, which is produced through partnership between Brevard County Government and Space Coast Advertising, focuses on County projects and initiatives that were completed within the past quarter, projects that are currently underway and projects that are planned in the months ahead. 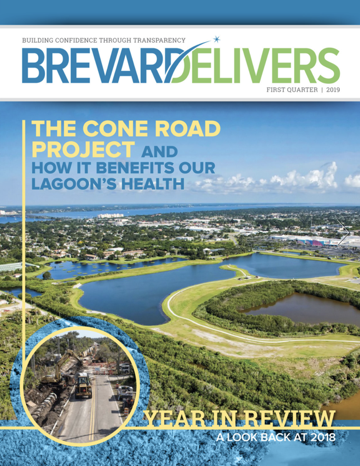 Published copies of Brevard Delivers will be available beginning next week at County Commissioner's Offices, County libraries and at the Brevard County Government Center in Viera. To subscribe and receive future editions of Brevard Delivers, please visit http://apps.brevardcounty.us/PublicInformationReleases/ and be sure to click on Brevard Delivers under Public Information Release Categories. BREVARD COUNTY, FL. -- More than $35 million has been earmarked for beach restoration in Brevard County under a 2018 Work Plan funding list released by the U.S. Army Corps of Engineers. The Work Plan includes approximately $28.4 million for initial construction of the Mid-Reach segment of the Brevard County Hurricane and Storm Damage Reduction Project. The restoration is expected to take place between December 2019 and May 2020. The Mid-Reach Project will provide continued maintenance of Brevard County's shoreline which will sustain healthy beaches for the enjoyment of residents and visitors and furnish habitat for endangered species, including thousands of sea turtles that nest along the Mid-Reach each year. Sand placement along this shoreline is essential in order to avoid coastal armoring. In some Florida communities armoring has narrowed the public beach and reduced sea turtle nesting habitat. For more information about the Mid Reach Project, contact Mike McGarry at Mike.Mcgarry@brevardfl.gov or (321) 372-5194. BREVARD COUNTY, FL. -- A meeting of the Environmentally Endangered Lands Program's Selection and Management Committee, established by the Brevard County Board of County Commissioners, will be held from 1-4 p.m. Wednesday, June 6, at the EEL Program's Office located at 91 East Drive in Melbourne. If a person desires to appeal any decision made by this board, agency or commission (as appropriate) with respect to any matter considered at this meeting or hearing, such a person will need a record of this proceeding and that, for such purposes, such person may need to ensure that a verbatim record of this proceeding is made, at his/her own expense, which record includes testimony and evidence upon which any such appeal is to be based." In accordance with the Americans with Disabilities Act and Section 286.26, F.S., persons needing accommodations or any interpreter to participate in the proceeding should contact Laura Clark, EEL Program Administrative Secretary, no later than 48 hours prior to the meeting, at (321) 255-4466." BREVARD COUNTY, FL. -- The Environmentally Endangered Lands Program's Selection and Management Committee, established by the Brevard County Board of County Commissioners, will be visiting Grant Flatwoods Sanctuary on Saturday, June 2 from 9 a.m. - noon. The public is welcome to attend. Participants will be meeting at 3909 Old Dixie Highway in Grant Florida. The purpose of this site visit is to receive a tour of publicly held conservation lands to assess ecological management accomplishments. Please RSVP no later than noon on Friday, June 1. BREVARD COUNTY, Fla. -- The deadline to apply fertilizer to lawns is fast approaching. Unincorporated Brevard County and many municipalities ban the application of fertilizer containing nitrogen and phosphorus from June 1 to Sept. 30. Also, most ordinances specify that no phosphorus can be applied unless a soil test indicates a phosphorus deficiency. To determine if a fertilizer contains phosphorus, simply look for the three numbers on the fertilizer label. If the middle number is zero, the fertilizer contains no phosphorus. The first number is always nitrogen, and the last number is always potassium. For example, a fertilizer labeled 0-0-27 contains no nitrogen or phosphorus. Many ordinances also require that fertilizers contain at least 50 percent slow-release nitrogen. Visit http://sfyl.ifas.ufl.edu/brevard/lawn-and-garden/fertilizer-ordinances/ to find your local ordinance. If you need more information on how to select or apply fertilizer, contact the UF/IFAS Extension in Brevard County at 321-633-1702. BREVARD COUNTY, FL. - A meeting of the Environmentally Endangered Lands Program's Selection and Management Committee, established by the Brevard County Board of County Commissioners will be held from 1 p.m. - 4 p.m. on Friday, May 4, at 91 East Drive in Melbourne. Click for printable flyer with details. BREVARD COUNTY, FL. - A meeting of the Environmentally Endangered Lands Program's Procedures Committee, established by the Brevard County Board of County Commissioners will be held on Thursday, May 3, from 2 p.m. - 4 p.m. at 91 East Drive in Melbourne. In accordance with the Americans with Disabilities Act and Section 286.26, F.S., persons needing accommodations or any interpreter to participate in the proceeding should contact Laura Clark, EEL Program Administrative Secretary, no later than 48 hours prior to the meeting, at 321-255-4466. BREVARD COUNTY, FL. -- A new process implemented at the Brevard County Government Center will provide visitors to Board of County Commissioners' meetings full and indepth access to meeting agendas and the supporting documents on items under consideration, debate and potential approval. A four-member Lean Six Sigma Agenda Development Process team made up of County employees was chartered to significantly reduce the amount of paper, time and staff resources expended during the agenda development process.After months of preparation, the team selected the NovusAGENDA software solution, a cloud-based application and database. Agendas, individual items, attachments and background documents are available to citizens online at www.BrevardFL.gov/OnlineAgendas. Agendas can run anywhere from two to eight pages or more, but add to that the extensive background documents on particular items of legislation, along with maps, diagrams, photos and other data and it becomes the equivalent of lugging around a file cabinet. From a general public standpoint, printed agendas are made available to those who attend board meetings, yet those do not include the more extensive background items that Commissioners have at their fingertips. While BOCC agendas posted on the County website do include those background materials, until the redesign and implementation of NovusAGENDA, they were not readily accessible on mobile devices to those attending board meetings. For citizens who attend BOCC meetingxs, a kiosk has been setup in the lobby outside Board Chambers, located on the First Floor of Building C at the Government Center in Viera, that will provide finger-touch opportunity to review the agenda and look up particular items and background materials. Additionally, the agenda can be downloaded to a mobile device to follow electronically during the meeting. NovusAGENDA is an application that's being used or implemented in other counties and municipalities throughout Central Florida. It saves money; it saves paper; it saves trees. TITUSVILLE, FL. — The North Brevard Commission on Parks and Recreation will hold its next monthly meeting on Thursday, April 12, at 5 p.m. The meeting will be held in the Brevard Room at 518 South Palm Avenue in Titusville. The public is invited to attend. The Brevard Room is located in a building on the north side of the parking lot behind the Brevard County Government Center North. For questions call Jeff Davis Jr. at (321) 264-5105. BREVARD, FL. -- For the fourth year in a row, the National Recreation and Park Association (NRPA) is collaborating with The Walt Disney Company - including Disney|ABC Television Group and ESPN — to help fund local park improvement projects in 16 U.S. cities through the national "Meet Me at the Park" Earth Month campaign, including a park right here in Brevard County. Through the "Meet Me at the Park" Earth Month campaign, one of three local parks will receive a $20,000 grant and Brevard County residents get to choose which one. Our local parks make Brevard County a better place to live. That's why from April 1 to April 30 Brevard County residents will have the opportunity to help one of three Brevard County Parks and Recreation projects receive $20,000 in grant funding to make improvements. The Brevard County Parks and Recreation Department Junior Naturalist Program will be a hands-on educational program designed for youth ages 10 - 17. A rustic amphitheater will be constructed, and a quarter-mile trail will be created. The Brevard County Parks and Recreation Department will build an Interpretive Pathway for educational programs and family friendly encounters that incorporates early Pioneer life in Florida and human relation to natural areas. During April, a public service announcement (PSA) supporting the Meet Me at the Park Earth Month campaign will be shared with audiences across Disney, including ESPN, ABC Television Network, ABC-owned and affiliate stations, Freeform, Disney Channel, Disney XD, Disney Junior, Radio Disney, the ABC Watch app and other platforms. The PSA will also be available to view on the voting site at NRPA.org/DisneyMeetMeAtThePark. Additionally, Radio Disney will support the campaign with an on-air radio spot. Last year, Brevard County voted for Ulumay Wildlife Sanctuary to get $20,000. With that funding, the community is now able to enjoy three small viewing platforms approximately 4-5 feet high and a recently renovated viewing tower approximately 12-16 feet high, allowing individuals the ability to further experience and enjoy wildlife. This year, resident votes will help improve another one of Brevard County's great parks. Part of a $1.5 million investment from The Walt Disney Company, the Meet Me at the Park program supports NRPA and Disney's combined goal of providing one million kids and families with greater access to play. *Standard messaging and data rates may apply. Both promotions begin at 12 a.m. ET on April 1, 2018 and conclude at 11:59 p.m. ET on April 30, 2018. No Purchase Necessary to participate. The NRPA Meet Me at the Park Promotion and Voter's Sweepstakes (collectively, "promotions") are open to legal residents of the 50 US & DC, who are 18 years of age or older. For complete details and Official Rules for both promotions, visit www.meetmeatthepark.org. BREVARD COUNTY, FL. - A meeting of the Environmentally Endangered Lands Program's Selection and Management Committee, established by the Brevard County Board of County Commissioners, will be held on Wednesday, April 4, 2018 from 1:00 - 2:30 p.m. at the EEL Program Office, 91 East Drive, Melbourne, Florida. BREVARD COUNTY, FL. -- Brevard Delivers, Brevard County Government's first quarterly report for 2018, is now available online at https://www.brevardfl.gov/BrevardDelivers. Brevard Delivers, which is produced through partnership between Brevard County Government and Space Coast Advertising, focuses on County projects and initiatives that were completed within the past quarter, projects that are currently underway and projects that are planned in the months ahead. The first quarterly report for the year includes an Annual Report that highlights accomplishments from 2017. It also spotlights the tax-funded 10-year restoration effort of the Indian River Lagoon. Published copies of Brevard Delivers will be available beginning next week at County Commissioner's Offices, County libraries and at the Brevard County Government Center in Viera. To subscribe and receive future editions of Brevard Delivers, please visit https://apps.brevardcounty.us/PublicInformationReleases/ and be sure to click on Brevard Delivers under Public Information Release Categories. BREVARD COUNTY, Fla. -- Recycled paint will be available to residents of Brevard County at five Richard Paint stores and two Ace Hardware store beginning Saturday, March 31. The paint is free to homeowners in limited quantities. Homeowners will be able to receive up to 10 gallons of one color for the shell of the house and up to three gallons of a second color for trim. Paint will be available on a first come first served basis only. Proof of home ownership will be required in order to obtain paint (i.e. valid driver's license with the current residential address or property tax notice). The recycled paint is available in five colors and one floor paint. For more information regarding the recycled paint call (321) 633-1888, (321) 633-2042 or visit our website at www.brevardcounty.us/swr. BREVARD, Fla. -- The Brevard County Environmentally Endangered Lands Program will be holding this year's Earth Day celebration, Saturday, April 21st, from 10 a.m. to 3 p.m. at the Enchanted Forest Sanctuary located at 444 Columbia Blvd., in Titusville. During this free event, guests will have the opportunity to see Florida Wildlife, guest presentations on conservation, explore environmental exhibits, participate in a guided walk, listen to live music, and much more. Earth Day Festival will also feature activities for youth, including face painting, crafts, and hands-on activities. For more information on the Enchanted Forest Sanctuary and the Environmentally Endangered Lands Program, please call (321) 264-5185 or visit us online at www.eelbrevard.com. Brevard County, Fla. -- Brevard County Fire Rescue (BCFR) is set to launch their new mobile application, PulsePoint, at 10 a.m. on Thursday, March 22, in the Brevard County Commission Chambers; 2725 Judge Fran Jamieson Way, Viera. PulsePoint is aimed at providing bystander CPR and Automated External Defibrillator (AED) assistance to those in immediate need. PulsePoint works by notifying application users, including trained citizens, visitors and healthcare professionals, if someone nearby is having a cardiac emergency, while local paramedics and firefighters are simultaneously dispatched. The app also directs citizen rescuers to the exact location of the closest publicly accessible AED. Cardiac arrest is a leading cause of death in the United States, accounting for an estimated 424,000 deaths each year, or more than 1,000 deaths per day. The American Heart Association estimates that effective bystander CPR, provided immediately after cardiac arrest, can double or triple a person's chance of survival. However, less than half of cardiac arrest victims receive bystander CPR, or CPR administered by a trained person on scene, or the use of an AED. "With such a short window of opportunity in cardiac arrest cases, early CPR and defibrillation is the key to survival. Brevard County Fire Rescue and our municipal partners are committed to improving the chain of survival," said Brevard County Fire Chief Mark Schollmeyer, "and ultimately positive cardiac arrest outcomes, through the use of technology and citizen engagement." By bringing the PulsePoint App to Brevard, our county will now join the ranks of the various other municipalities and counties throughout the country currently utilizing PulsePoint, including Los Angeles and San Diego County, the District of Columbia, the city of Madison, Wisconsin and our neighbors in Orlando. Brevard County Fire Rescue was able to initiate the PulsePoint project and application launch with the receipt of the State of Florida EMS Trust Award. Through which, Brevard County Fire Rescue was awarded $23,000 of initial funding, and $13,000 of funding per year guaranteed for the next 5 years. Much of the funding for the EMS Trust Award comes from fines collected by the State of Florida through traffic tickets. PulsePoint and Brevard County Fire Rescue, along with our partner agencies, are providing our community with a unique opportunity to build a partnership between citizens and first responders. Through this collaboration, BCFR is determined to bring immediate CPR and AED assistance to anyone in need. To learn more about PulsePoint or how your agency can be involved, visit pulsepoint.org. BREVARD, Fla. -- Brevard County Central Area Parks Operations is now accepting applications for food vendors for the 2018 Summer Camp Program. Vendor(s) will serve approximately 300 students per week at six different Central Brevard locations, which include Kiwanis Island Park, Woody Simpson Park, McLarty Park, Travis Park, Joe Lee Smith, and Cocoa West. Vendors can obtain applications at the Central Area Parks Operations Office, located at 840 Forrest Avenue, in Cocoa, or via email at Jesi.Ray@BrevardParks.com. Office hours are 8:00 a.m. to 5:00 p.m., Monday through Friday. The deadline for receipt of completed applications is 4:00 p.m., Friday, April 6. Selected food vendors will be notified by Friday, April 13. Vendor selection is based on, but not limited to, application submission date, price of products to the public, proper licensing, and appropriateness of the products. Appropriateness includes, but is not limited to, products that are health conscious, snacks, sweet treats, and beverages appropriate for K-6th graders. There is no cost to submit an application. If selected as a vendor, a fee of $60/week for the 6 camps sites will be assessed over the course of the summer. Please call 321-633-1874 for additional information on this and other recreation programs sponsored by Brevard County Parks and Recreation in Central Brevard. BREVARD COUNTY, FL. - Brown tide conditions on Indian River Lagoon, especially in the Banana River and Sykes Creek, have prompted a reminder for residents to report any sighting of fish kills to the Florida Fish and Wildlife Conservation Commission. Isolated fish kill events occur most often during the spring and summer as temperatures rise. The most common cause is low dissolved oxygen in the water. Algal blooms, like the brown tide currently blooming in the Indian River from Port St John to Vero and throughout the Banana River, consume oxygen at night and during cloudy days, sometimes leaving insufficient oxygen for fish and other marine life. Algal blooms are fed by excess nutrients often related to human activities. Residents can play a role in helping avoid fish kills. That includes keeping leaves and grass clippings off the streets, canals and out of storm drains; following local fertilizer ordinances; preventing over irrigation; maintaining septic systems; and repairing leaky sewer pipes. In response to the record-breaking fish kill of March 2016, Brevard County residents voted to impose a half-cent sales tax to fund a 10-year plan to cleanup and restore health to the Indian River Lagoon. The Save Our Indian River Lagoon Project Plan is updated annually and posted online at https://www.brevardfl.gov/SaveOurLagoon. To date, six projects have been completed and over 60 projects are scheduled to begin this year. After many decades of allowing too much pollution to enter the lagoon, it will take hundreds of projects and years of cleanup to reduce the risk of severe algae blooms and associated fish kills. TITUSVILLE, Fla. — The North Brevard Commission on Parks and Recreation will hold its next monthly meeting on Thursday, March 8, at 5:00 p.m. The meeting will be held in the Brevard Room at 518 South Palm Avenue located in Titusville. The public is invited to attend. MELBOURNE, Fla. -- The joint meeting of EEL Program Selection and Management Committee / Procedures Committee meeting, previously scheduled for March 7, at 2:45 p.m. has been postponed. A new date for the joint meeting will be provided once it has been established. The original meeting of the Selection and Management Committee will still be held on March 7, at 1:00 p.m. located at 91 East Drive, Melbourne. Any questions regarding this meeting should be directed to Laura Clark at (321) 255-4466. Participants will need access to the internet as this course has online components. All classes must be attended. Cost is $250.00 and must be paid upon successful completion of the skills test on March 10th or 31st. Class size is limited. Pre-registration is recommended. Minimum of five participants are needed to hold the class. Interested candidates must be 16 years of age or older, maintain floating position on back for 1 minute, tread water for 1 minute, and be able to swim 25 yards of front crawl, back crawl, breaststroke, sidestroke, elementary backstroke, and 15 yards of butterfly. Upon completion, participants will receive American Red Cross certification as a Water Safety Instructor, and be able to teach swim lessons and water safety presentations. New storm surge modeling will result in changes to flood zone areas on the Barrier Island and Merritt Island. Some areas will have revised flood elevations, which will impact annual flood insurance premiums, both positively and negatively. Some areas not currently in flood zones (Special Flood Hazard Areas) will change and be included, which will then require mandatory flood insurance for a mortgage. TITUSVILLE, Fla. -- The North Brevard Commission on Parks and Recreation will hold a special meeting at 5 p.m. on Wednesday, Feb. 28. The meeting will be held at the Sandrift Community Center located at 585 North Singleton Avenue, Titusville. The public is invited to attend. For questions please call Jeff Davis Jr. at (321) 264-5105. BREVARD COUNTY, Fla. -- Brevard County Ocean Rescue will host the second group for seasonal lifeguards on Feb. 24. Ocean Rescue is looking to fill 30 positions. Those hired on as ocean lifeguards will work from March to October for the 2018 year. Those trying out should meet at Rockledge High School's swimming pool, 220 Raider Rd, no later than 7 a.m. Candidates will not be permitted to test if they are late. While no lifeguarding experience is necessary, candidates must be over the age of 16 by March 10, the first day of training, and possess strong swimming skills. All candidates must bring a valid driver's license, Social Security card, appropriate swim attire, a towel and running shoes. If selected, completion of the hiring process is dependent on the candidate's ability to pass a background test and successful completion of Ocean Rescue's paid training academy. The starting pay for ocean lifeguards is $10.24/hour. For additional information on the tryouts and Brevard County Ocean Rescue, please visit the department's page at www.brevardfl.gov/FireRescue/OceanServices. You can also contact Ocean Rescue staff at (321) 633-2056 or email at Fire.Rescue@brevardfl.gov. BREVARD COUNTY, FL. -- The U.S. Coast Guard will implement a deviated openings schedule from normal operating times for Mathers Bridge in south Merritt Island starting at 6 a.m. Monday, Feb. 5, through 6 a.m. Saturday, Aug. 4. During the deviation period, the bridge will open for vessels requesting passage on the hour and half hour, from 6 a.m. to 10 p.m. Sunday through Thursday. On Friday, Saturday and any federal holidays, 24 hours a day, the bridge will open for vessels on the hour and half hour. At all other times, the bridge will open on signal if at least two hours notice is provided. For more information, please contact Brevard County Road and Bridges at (321) 455-1389. EEL Program Procedures Committee Meeting Feb. 1. BREVARD COUNTY, Fla. -- A meeting of the Environmentally Endangered Lands Program's Procedures Committee, established by the Brevard County Board of County Commissioners, will be held from 2- 4 p.m. on Thursday, Feb. 1, at the EEL Program Office, 91 East Drive, Melbourne. The purpose of this meeting is to review policies and procedures of the EEL Program. Any questions regarding this meeting should be directed to Laura Clark, (321) 255-4466, or Laura.Clark@brevardfl.gov. If a person desires to appeal any decision made by this board, or commission (as appropriate) with regard to any matter considered at this meeting or hearing, such a person will need a record of this proceeding and for such purposes, such person may need to ensure that a verbatim record of this proceeding is made, at his or her own expense, which record includes testimony and evidence upon which any such appeal is to be based. In accordance with the American Disabilities Act and Section 286.26, F.S., persons needing accommodations or any interpreter to participate in the proceeding should contact Laura Clark, EEL Program Administrative Secretary, no later than 48 hours prior to the meeting at (321) 255-4466. EEL Program Recreation and Education Committee Meeting Feb. 8. BREVARD COUNTY, Fla. -- A meeting of the Environmentally Endangered Lands Program's Recreation and Education Committee, established by the Brevard County Board of County Commissioners will be held on Thursday, Feb. 8 from 6- 8 PM at the EEL Program Office, 91 East Drive, Melbourne. Any questions regarding this meeting should be directed to Brad Manley, (321) 255-4466 or Brad.Manley@brevardfl.gov. If a person desires to appeal any decision made by this board, or commission (as appropriate), such a person will need a record of this proceeding and that, for such purposes, such person may need to ensure that a verbatim record of this proceeding is made, at his/her own expense, which record includes testimony and evidence upon which any such appeal is to be based. In accordance with the Americans with Disabilities Act and Section 286.26, F.S., persons needing accommodations or any interpreter to participate in the proceeding should contact Laura Clark, EEL Program Administrative Secretary, no later than 48 hours prior to the meeting, at (321) 255-4466. BREVARD COUNTY, FL. -- Alert 9-1-1 dispatchers and the Enhanced 9-1-1 system helped Brevard County Fire Rescue locate and render swift medical aid Sunday morning to an elderly resident of West Melbourne. The resident of the Stratford Point Drive subdivision may have suffered from a medical issue that caused him to fall while a pot was cooking on the stove. He was apparently able to dial 9-1-1, but was unable to speak when the call was answered by 9-1-1 dispatchers. The Enhanced 9-1-1 system helped dispatchers pinpoint the caller's address. When the 9-1-1 call was received just after 9 a.m., no one was on the other end of the phone line but dispatchers could hear a smoke detector inside the home and could hear movement inside the structure, said District Chief Geanine Dotson. Firefighters responded from Brevard County Fire Rescue stations 83 and 82 and were able to gain access into the home through a window. Once inside, they located the resident on the kitchen floor. The resident was transported to Holmes Regional Medical Center in Melbourne. Dotson said there were no other occupants inside the home and no other injuries were reported. Smoke from the pot left on the stove had activated the smoke detector. She said firefighters aired out the home. Palm Bay Fire Engine 3 was also on scene. "Between the resident being able to get to the phone to dial 9-1-1, the Enhanced 9-1-1 system and that our dispatchers were able to identify the smoke detector and movement over the phone all helped in a successful outcome this morning," Dotson said. BREVARD County, FL. -- Brevard County Housing and Human Services will be hosting a Post Disaster Recovery Program for Brevard County residents seeking assistance from Hurricane Irma damages from 8:30 a.m. to 3 p.m. on Monday, Jan. 22; Tuesday, Jan. 23; and Wednesday, Jan. 24, at the Viera Regional Park Community Center, 2300 Judge Fran Jamieson Way in Viera. One-time assistance is available for rent, mortgage, rental deposit, and filling the homeowner insurance gap for income eligible Brevard county residents on a first-come (application complete with all required information) first-served basis, contingent on the availability of funds. Applicants will be prioritized with elderly (all household members over the age of 60) and disabled (documented impairment) clients being a priority. Affidavit certifying assistance request as a result of Hurricane Irma. Bank statements for all household members from the past 60 days. Birth certificates for all children listed on the application. A state of Florida Driver's License or ID. Persons seeking mortgage, rental, or deposit assistance must additionally provide a current statement from their mortgage holder, rental company, or landlord detailing the current amount due. Additionally, one of the following is needed: a current yearly lease, HUD form-50059, a rent voucher worksheet from Section 8, or a rent adjustment notice from Public Housing. Applications can also be picked up at the Housing and Human Services Department, 2725 Judge Fran Jamieson Way B-106, Viera. Residents may request email or mail receipt of an application by calling (321) 633-1951 or (321) 633-2076. TITUSVILLE, Fla. -- The North Brevard Commission on Parks and Recreation will hold its next monthly meeting at 5 p.m. on Thursday, Jan. 11. The meeting will be held in the Brevard Room at 518 South Palm Avenue in Titusville. The public is invited to attend. Shelter opens at 5:30 p.m. and closes the following day at 8 a.m. Dinner and breakfast will be served. Shelter opens at 6 p.m. and closes the following day at 7 a.m. Dinner and breakfast will be served. 1842 South Harbor City Blvd. Shelter opens at 8 p.m. and closes the following day 7 a.m. Dinner and breakfast will be served.